The Mega Chopper is the huge and rather terrifying big brother of the standard Chopper badnik. It appears in Sonic Generations, in the modern Sonic stages for both Green Hill and Seaside Hill. The fish is at its most dangerous in Seaside Hill, where it partols the shore to swallow up any hedgehogs who stray out into deep waters. 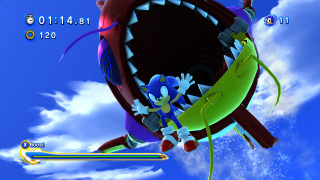 Presumably there to stop players using Endless Boost to run out into the ocean, the giant fish is immediatly fatal if it leaps out of the waves to snap up Sonic. In Green Hill, meanwhile, it's less deadly but more cinematic, chewing up the grindrails behind Sonic before leaping out of the underwatr caverns to snap at him. This page was last edited on 1 September 2012, at 13:03.